You are here: Home / Is It Paleo? / Are Processed Foods Paleo? Why Aren’t Processed Foods Paleo? Is There Any Confusion When It Comes To Processed Food Being Paleo? 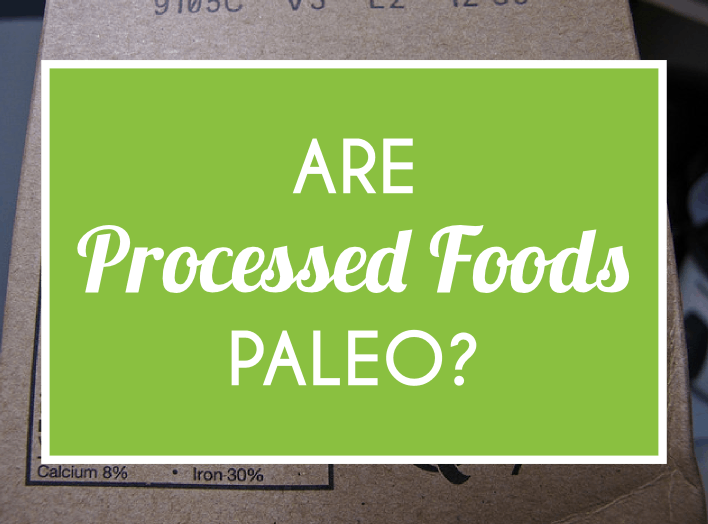 So Are Processed Foods Paleo? No. Processed foods are not paleo. An increase in processed foods in our diets is often blamed for the obesity epidemic and serious health problems that have been taking over western nations including the U.S over the past few decades. As people have become busier and busier, unfortunately they have turned to convenient, packaged, and processed foods to replace what used to be healthy, fresh, home cooked meals made with only whole foods. Processed foods, meaning those that are not found in nature but that are instead created in complex food laboratory settings, often come in fancy packages and are filled with artificial ingredients, sweeteners, sodium, preservatives, and emulsifiers. These are certainly not paleo for a few main reasons. Processed food lacks any nutrients at all. It offers nothing in terms of vitamins, minerals, protein, fiber, or anything else that’s beneficial to the body. Packaged sweet goods like candy, cookies, granola bars, cereal, and soda all have an extremely high sugar content and therefore very high scores on the glycemic index. This means they can cause serious problems by spiking blood sugar levels, which can lead to insulin resistance, and causing other metabolic conditions for many people, not to mention serious weight gain. Many popular processed foods, including bread, chips, and cereal, are derived from artificial ingredients, GMO substances, chemicals, and preservatives, all of which the paleo diet aims to avoid completely. So what types of foods are technically “processed”? Processed foods normally have a long, complicated ingredient list that is hard to decipher. They are filled with food-like substances that have no place in your food. Think of it this way: if you would not stock an ingredient in your own kitchen, like high fructose corn syrup or soy lecithin for example, then you should not be eating processed foods that contain these types of artificial and harmful ingredients either. Your body does not know what to do with unnatural foods like these, which causes digestive distress, malabsorption, and a lack of real nutrients in the diet. You want to stick to as few ingredients as possible and ideally eat only foods that come directly from nature and that are ingredients themselves (for example, almonds, broccoli, fish, eggs, spinach, walnuts, and so on). any packaged product with refined sugar (cane sugar, brown sugar, beet sugar, anything labeled “evaporated” or “syrup” or “malt”). This can be tricky because sugar is disguised with so many different names but, generally speaking, if it sounds unpronounceable, you cannot picture what the ingredient looks like, and it has any of these sugar trigger words it in, avoid it! And don’t be fooled. Processed food that is labeled “diet” or “light” is no better and should also be avoided, as these products are filled with even more artificial chemicals and sweeteners to enhance their taste and appearance after the naturally occurring fat and carbs have been removed. Artificial sweeteners disrupt the body’s natural ability to regulate calorie intake and make us crave even more sweets, so even though we skip the sugar by opting for diet soda or yogurt for example, we’re left searching for sugar in other forms later on. Lose, lose. Another important way to avoid processed food and its consequences is to stick with drinking water or maybe some coffee and tea. Whatever you do, stay away from soda and other artificially sweetened drinks like fake fruit juices, milk products, and sweetened teas. It’s best to make the majority of your liquid consumption plain water, which, unlike sweetened beverages, has zero calories, carbs, sugar, fiber, protein, or fat. In fact, giving up sweetened drinks alone could greatly improve your health. No. There is no disagreement when it comes to processed foods, like soda, cookies, bread, cereal, candy, milk, yogurt, and so on, being paleo. Even nutrition experts who follow diets that are very different to the paleo diet agree that processed foods are harmful and devoid of any real nutrients, and so that they should be avoided at all costs. There are an endless amount of studies that continue to point to the fact that the more processed food you consume, the more negative consequences you will likely experience. These foods are the main reason for so many people’s ongoing stuggles with their weight and health. They should really be removed from your diet as soon as possible. No. No types of processed food are paleo. Processed foods are far from natural, fresh goods. They are filled with fake and manipulated ingredients, they’re usually extremely high on the glycemic index, they’re filled with sodium, they’re harmful to the health of humans in many ways, and they lack any real nutrients at all.